Do you ever have a product that's so amazing, but you somehow keep forgetting to tell people just how unbelievable it is? It's like you keep using it and using it, all the while knowing it's so incredible you just have to shout it from the rooftops, but for some reason you just never remember to discuss its unbelievability. 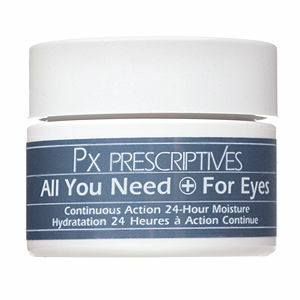 Well, that's how I feel about Prescriptives All You Need+ For Eyes Continuous Action 24-Hour Moisture -- and it's finally time for me to tell you all about it. This cool, creamy gel is housed within an assuming white tub ... but trust me when I say there is nothing unassuming about this miracle worker. It's thick but not greasy and remains cool for quite some time after being applied to the skin. Plus it sinks in immediately so there's no annoying residue left behind. I usually find it tough to find an eye cream that's good to use both day and night -- but this one really seems to do the trick. It brightens up my annoyingly deep dark circles, puffs up the sallow skin around my eyes and even works to reduce the wrinkles I've unfortunately started to accumulate. And with a combination of vitamins, antioxidants and plant extracts, it helps to keep skin looking refreshed and rejuvenated for hours on end. So now I've finally told you about the amazingness of Prescriptives All You Need+ For Eyes. I feel much better. Prescriptives All You Need+ For Eyes retails for $34 at beauty.com.